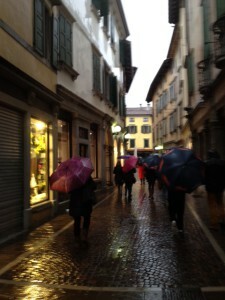 Christianity came here in the 7th century, we came on a rainy day. We scurried over the Devil's bridge and listened to an interesting tale from our guide extraordinaire Francesca, who got us out of the rain and into the Cividale Museum. Their relics are amazing and include a reliquary of St Anthony of Padua,, the Patron Saint of girls looking for a husband (@Luscious_Lushes Thea and I took note) The showpiece of the museum is a baptistery of elegantly carved white marble, so perfectly preserved it looks like a celestial Jacuzzi. Side by side, earlier Christian art is almost Egyptian in its simplicity compared with elaborate renaissance imagery. Cividale has many small but important churches some back to the 8th century when they told vivid stories with frescoes. The Tourist Board here keeps it fresh. They can also provide comprehensive info for visitors helpful to planning and maximizing your visit. You can find a lot at www. Cividale. Net or for individual help contact informacitta@cividale.net. Maps, ideas and cheerful help await you in this lovely historic town. 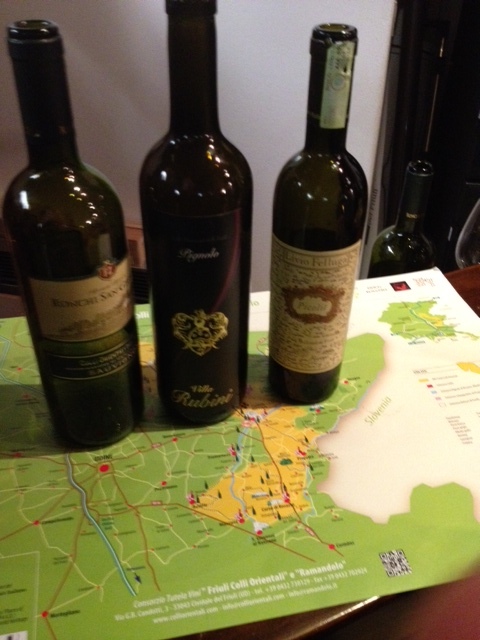 Next up was the Consortia Colli Orientali del Friuli. Here at the Consortia's space, members have examples of their wines and a lot of educational material to help you really get educated on the area. We saw a short video to introduce us to the land and history of this region of sandstone and marlstone where wine has been made for 2000 years. Through a video survey of the region we got a sense of how ancient fortresses and castles have been woven into today’s delicious wine region. Hora Bibendi was a sundial that let you know when Happy hour starts.Our happy hour started when they served us examples. The best way to explore the region: in a glass! 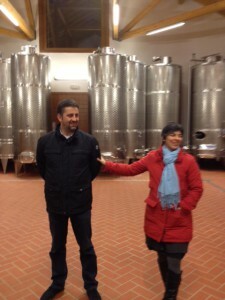 Next, we were greeted by Paolo and his wife at I Comelli in Udine, very near the Austrian-Slovenian border. 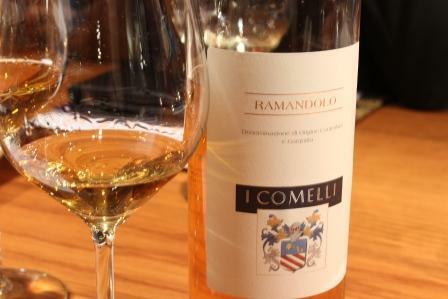 I Comelli is famous for Ramandolo a unique wine that takes its name from the place and has a long history— its first official appearance is when it was offered to Pope Gregory the first, so that would be 590 - 604. Verduzzo friulano giallo is the grape from which Ramandolo is made. It has a white berry packed with tannins. 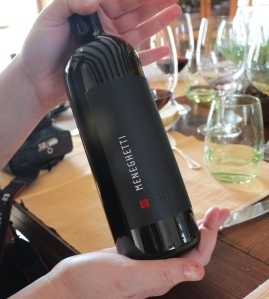 The tannins have a cleansing effect which makes Ramandolo a sweet wine with a lovely but not cloying finish. The color is dark gold. Its peachy aromas have caramelly hints. Silky mouth feel and yummy noble rot, with a lingering finish of dried pears and that tasty, tasty botrytised sweetness.Only 60 hectares and the only sweet wine to be marked DOCG. 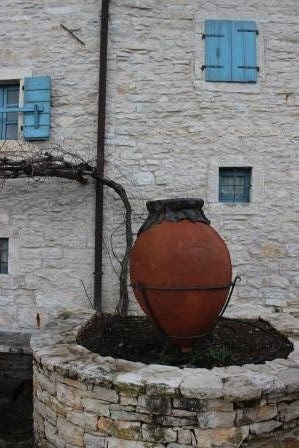 The DNA of grape shows it came from the Balkans not from any Mediterranean source. 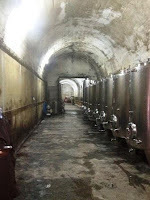 In nearby, Aquileia excavators found fermented Ramandolo in 5000 yr necropolis …Nine Euros at the winery? What? More Somms out there should put this on your list for dessert wines! Slovenia. Yugoslavia. Austria. Venice. The region has flown many flags in the last 200 years. Many people immigrated away but the Comellis stayed and focused on cultivating the soil as they have for many years working and preserving the area for its natural beauty and touristic potential. Picolit is also made here in small quantities As well as Friulano. 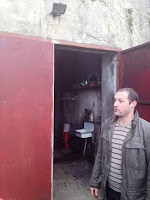 The cellar is modern and has been rebuilt when they outgrew the older one. So they combine modern and traditional to take the best of each to make great wine. And what goes with good wine? Good food. We adjourned to their restaurant which is attached to an Agri-turismo hotel. A charming spot with a wood – fire. We were served fresh delicious Friuliani dishes. 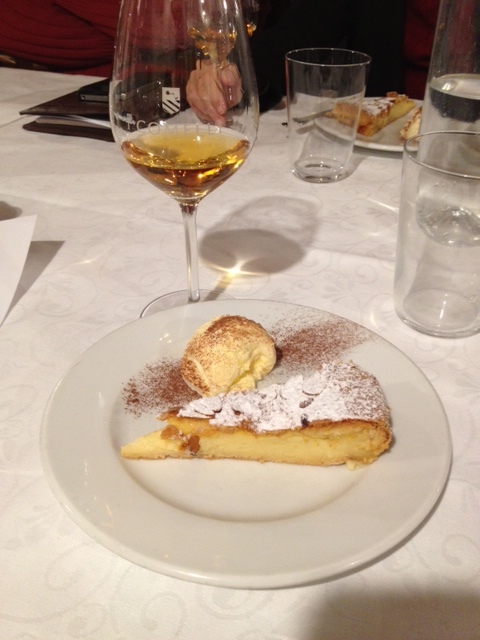 Starting with lovely prosciutto and ending with Torta Della Nonna, each matched with the delicious I Comelli wines. Pictures. Schmictures. If you can, find a way to visit yourself. Two words: Randolo mousse. Yes. This is heaven. But for a few intrepid bloggers, an additional level of heaven awaited as we ascended to L’ Uva e le Stelle. A property owned by a different family also named Comelli. We wanted to stay forever. The Rockridge A16, in contrast to the San Francisco location is bigger, lighter and brighter and most important: A LOT easier to park. It's meant to focus on the eastern side of the highway closer to the sea so a lot more seafood options. They had my favorite, grilled calamari. Zesty southern Italian flair, it was spiced with lovage root, whose almost gingery notes made for an interesting starter. . Followed by tender roast lamb, pink and perfect. I shared some of Liza's roasted Pork Shoulder---that girl has a knack for finding the "dish of the night". Succulent, juicy and sauce to spare. Our server thoughtfully provided a dish of crusty bread for dipping. 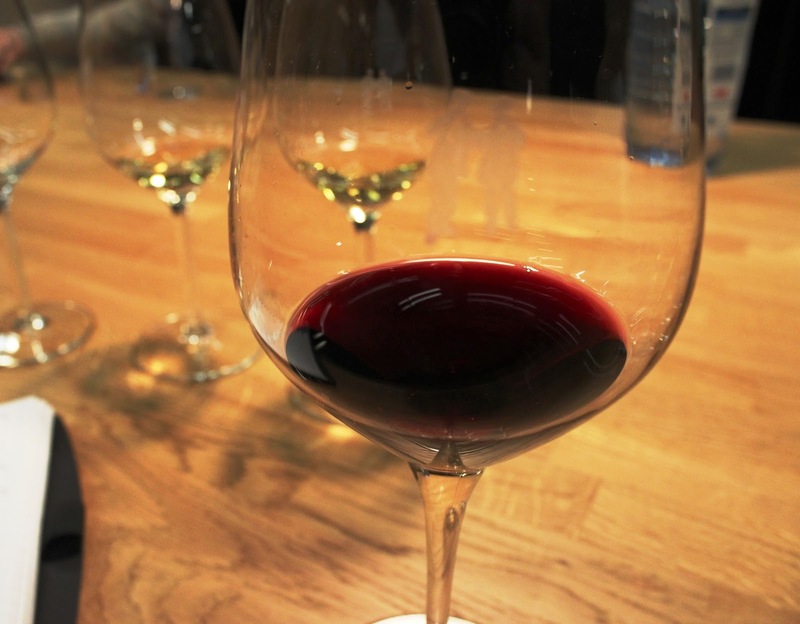 The wine list is packed with unfamiliar Italian wines. But they promote a Sommelier on duty at all times. We went with Somm Jim's recommendation for wine and were happy with a minerally Pinot Noir like Red wine. 2007 I Custodi, 'Ætneus,' Etna Rosso, Castiglione di Sicilia, Catania . A blend of Nerello Mascalese/Nerello Cappuccio/Alicante. It was good with all our dishes. Thanks, Jim, it worked. 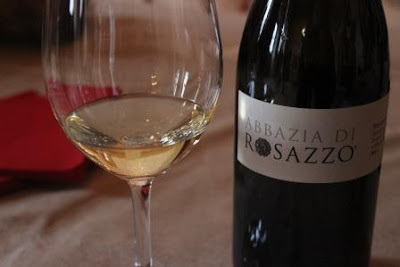 I prefer white wine and would have liked to have tried the Malvasia since they had one on the menu and Liza has been raving about that variety. Next time. I almost forgot to mention: Pizza! The new woodburning oven burns properly at 900 degrees and produces delicious pizza. The interesting shears you see next to my perfect martini were dedicated pizza divvying tools. We had fun sharing such good food and good times. Culture. Culture. Culture. In my recent exploration of the wine regions of Friuli-Venezia-Giulia, that one word in three contexts proved delightful. Viticulture. Yum. Arts and culture. Awesome. But another of the contexts is yogurt and by extension, all things dairy. In college I did an internship in Switzerland, and every since then have been hooked like a meth head junkie on all things European dairy. If you haven't experienced the creamy, wholesome deliciousness of dairy products that transcend this world. Well, okay our normal US world, then just another reason to add FVG (Friuli-Venezia-Giulia) onto your bucket list. Agritourism is a growing field as we travellers look to connect with the land and seek out adventure beyond the "If it's Tuesday it must be Belgium/Let's run through the Cairo museum in 45 min/Art/Culture/Souvenir" pit stops that can sucker you into trying to see everything. Newsflash. By trying not to miss anything, you miss a lot. Agritourism is a way to reverse that and stop time for a second to savor an experience. 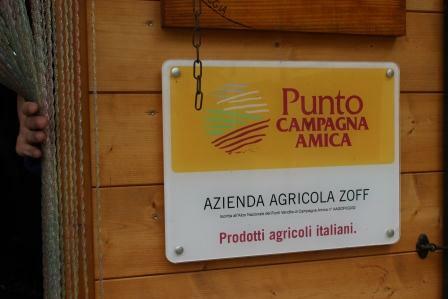 Visiting Azienda Agricola Zoff was definitely a moment to savor in all its contexts. 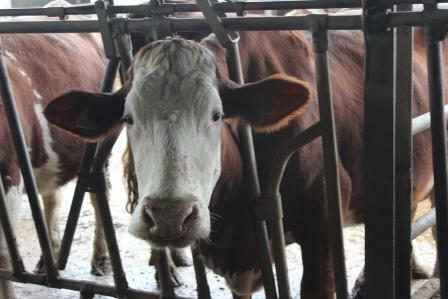 The stars of the show are the Pezzata Rosso cows that deliver the rich milk that Beppino Zoff and his team convert to wonderful cheeses, butter and best of all yogurt. The Zoffs have been making cheeses for 15 years as a way of using the raw milk from their adorably delicious cows. They have been raising cows for three generations. Originally, a dairy, they found they could be more successful making the milk into products. We tried several cheeses ranging from fresh to aged for 4 months. Caciotta: A fresh cheese that they served both plain, flavored with rose petals and flavored with thyme. Some other flavors available are elderflower, peppermint, mallow, marigold, sage, rosemary and basil. After 10 days, the fat on the outside of the cheese creates a matrix that is perfect to accept these floral/herbal flavor enhancements. But what completely blew us away was the yogurt. Fresh, creamy, sweetened with caramel. If any had fallen on the floor I would have licked it up it was that good. And because each gram contains 1,5 billion probiotic organisms, it's actually an amazing treat that is good for you. 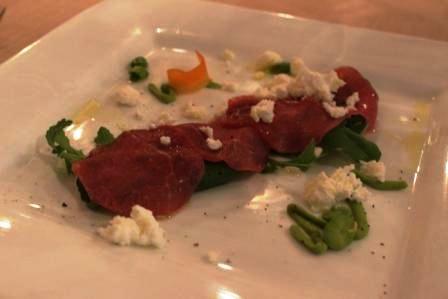 Beppino charmed us with his energy and how he put his passion on the plate. As he told us, cheese lets you experience not just the terroir, but the culture as well. Artisanal methods Zoff uses connect you both to that land and to the old ways. Located in the town of Udine, Abbazia de Rosazzo has a long history we could see in the architecture as we scurried in out of the rain. The name translates to: Monastery of roses. Legend says it was started around 800 by a hermit monk named Allemanus, who started an oratory on the present day site. It was such a culture of peace, that it grew to Abbey status. When the Benedictines took over, they brought wine and olive oil technology. These advances moved the Abbey forward economically and it grew very powerful under the protection of Rome. Even the Venetian doge had them make him a special wine. Then Venetians fought to capture the area and the abbey became a fortress, which caused spiritual decline as warrior monks took over and the peace was lost for many years. In 1533, the reconstruction was finished. After it was rebuilt, an artist was engaged to create frescoes all about St Peter to whom abbey had been dedicated in 1070. The area suffered after World War II as the formerly peaceful lifestyle was disturbed. People left the area abandoned. 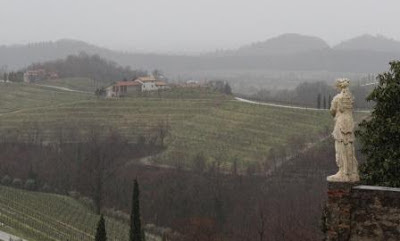 Until Livio Felluga, who couldn't bear to see the post war depression continue started to bring back viticulture, mixing new modern technology with hard work and a singular dedication toward rebuilding the wine culture in the area. He is credited with bringing back the Friuli wine region and thanks to his dedication and passion, we can visit the beautiful grounds and taste the lovely wine. And the Wine tasted more lovely drinking it in situ with awareness of the history of it. A blend of Friulano - Pinot Blanc - Sauvignon - Malvasia - Ribolla, it gave me a jolt of terroir. The wine was pale gold with aromas of flowers and citrus. It had round mouthfeel with flavors of something tropical and spice. The finish was medium. I marvelled at the taste of place it gave me, being able to look out on the terraced ronchi planted by monks, but restored by the visionary, Livio Felluga in 1979. There is more than destiny of taste. Our guide told us the story of how the original rose of the Abbey present for so many hundreds of years disappeared after World War I. Turned out, a soldier had brought a cutting to America. nurtured it and in 1929, when he heard of the rose's extinction, sent a clipping back and so the original rose of the abbey is there to this day. Exciting things are happening to help you explore the three wine regions known as Friuli-Venezia-Giulia ---FVG for short. The wonderful Chiara Tuppy from Vino e Sapori, spoke at the 2013 International Wine Tourism Conference that was held in Zagreb, Croatia. The theme for her discussion was the many ways her organization works to make it easier for visitors to experience what she termed, " Little pearls of discovery". This coordinating center organizes information, events, disparate groups, etc to be able to help travellers design their own wine and food adventures. From the logo you can see that wine, of course, is prominent. But also art, history, agriculture, architecture and the wonderful culture that infuses the area with an indefatigable spirit of hospitality. Over the next few posts I will try to highlight some jewels of my own discovery, but here I wanted to highlight a great resource for you when you plan to visit this wonderful area. There you will find collected all the information to match your available time and inclinations to the wonderful experiences that await you in FVG. At Vini e Sapori, they work with all the providers, large and small, and make sure that their operating hours are easily available to you. You can search by your dates to find out what will be open. Or, you can easily locate the contact info for a place not listed to be open when you are there to set up an appointment. Something wonderful they have done is set their members on a rotating schedule so that no matter when you arrive, you will be able to find an interesting range of places to visit. The larger places you would expect, but some of the most charming places are small and out of the way. Both are represented on the rotating schedule. And best of all: no reservations! Not just wine, but great agritourism hotels, delicious regional cuisine, fascinating farmhouses with cheeses and dairy straight from heaven. Olives. Did I mention wine? The site gives you tons of information. You can tap into pre-designed itineraries whose stops are easily grouped to help you find your own way. If this sounds like a lot of work, there are also links to tour operators who can make your trip easy, breezy with fun itineraries you can simply book online. Either way (or both), the discoveries you make will be your treasures. I got to find out during my visit there earlier this year that Friuli, Venezia and Giulia all have wonderful climates for curing ham, growing grapes, making wine and living life in a lovely area as tasty as it is rich in culture. I hope you get to see it with your own eyes...and by see I mean savor...and by savor I mean wine. All this typing is making me thirsty! that serves you on your time. Need a quick snack to fortify your wine trekking? Hit the Enoteca for some good advice and better fuel. But if you have time to experience the full service restaurant, prepare for a relaxing and tasty meal. Dario De Conti, along with partners, Valentina Guolo Migotto and Stefano Migotto have put together a charming spot with authentic Italian ingredients and seasonal bounty of California. The Arugula, herbs, etc come from their garden at the old Copia space; it's hard to get more local than that. 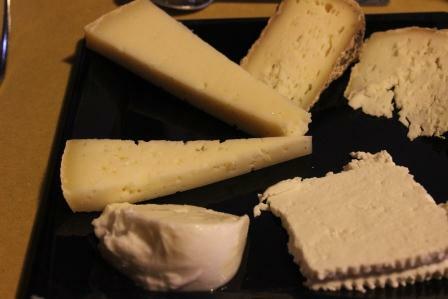 But most of the cheeses, flour etc come from Italy; it's harder to get more authentic than that. And Local and Authentic aside, their focus and dedication manifests in deliciousness---and you just can't get better than that. 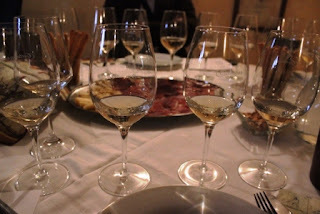 We were hosted at dinner by Dario and tasted through many of his delicious wines and amazing food. It was fun to get to know him a little too. Dario was born near Pordenone and went to school at the University of Padova. While he was studying winemaking, he worked as a pizzaiolo at night and perfected the art of Neapolitan pizza. The wood oven at 900 degrees cooks the pizza in exactly in 90 seconds. The dough hits the oven and forms a crust which is important since it has to hold the cheese and the proper tomato sauce is thin. The intense heat creates the perfect texture and just the right amount of char. Thought goes into everything , including balancing the tomato sauce with buffalo mozzarella, whose stronger taste to stands up to the tomatoes. 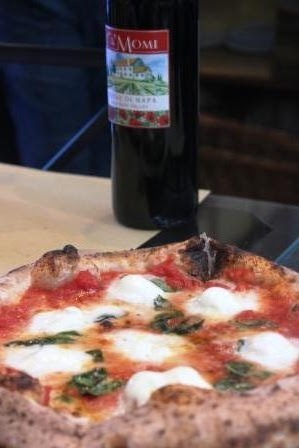 Neapolitans certified processes to make real traditional Italian pizza. 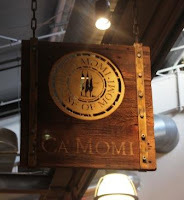 Ca' Momi's pizza transported me to Italian vacation days. Dario also explained the name "Margherita" It came from the name of the Queen of Italy in the 1890s, where in her honor, flatbread was garnished with tomatoes, cheese and basil to represent the Italian flag, Historical and delicious. But don't try asking for Parmesan or chili flakes---Ca' Momi is religiously Italian and eschews these American tagalongs. 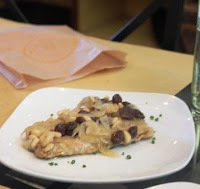 Farinata: Made with garbanzo flour typical of Liguria. This dish has a rich taste and a richer history dating back to the 1400 's when Genova Tuscany Venice and Amalfi were continuously fighting on sea. A ship of captured Pisans had to use hull full of north African ingredients To survive they made bread out of the garbanzo flour. 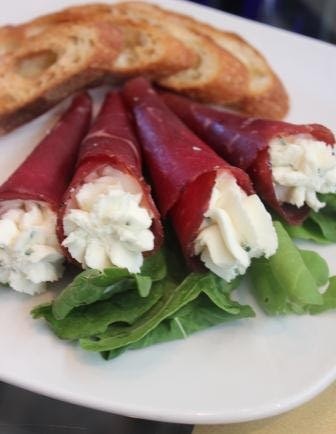 Involtini of Bresaola Cured thinly sliced beef is rolled around creamy Robiola cheese spiked with fresh chives. Like a Lombardy Piemonte plate. Gnudi: Bellwether Farms Ricotta made from the rich milk of Jersey cows gives this dumpling its pillowiness. Organic spinach, the perfect seasonings, along with sage and parmegiano-reggiano cheese complete the dish. 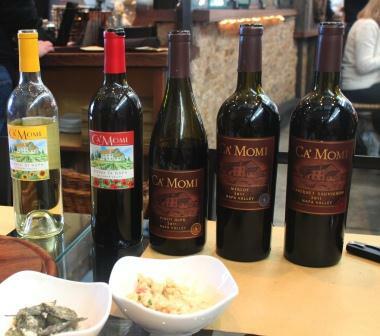 And the Ca' Momi wines complete the experience. We loved the expression of California fruit through Ca' Momi's Italo-centric lens. Dario pointed out that the California growing season takes the limits off the fruit (from Rutherford, Mt. Veeder and Atlas peak), so his Cabernet Sauvignon is powerful while at the same time retaining a juicy complexity. We loved the 2012 Zinfandel, Napa Valley for its spicy red fruit and food friendly nature. More information on the Passion Wines here, but let me tell you the House wines were delicious as well. BrixChick Heidi has a ton of notes on the wines we loved to love, so stay tuned for updates from her. Before I forget, Ca' Momi boasts a lovely list of Italian wines if you are feeling a little continental. 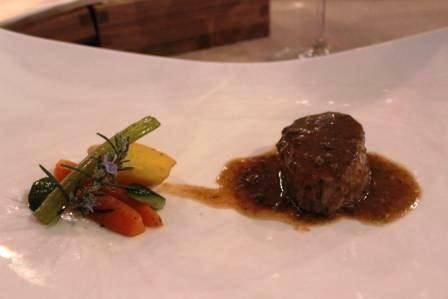 Italian culture on the plate. things the restaurant cooks starting at 4 am. Stefana focuses on this and is proud of the authenticity. You can dart into the kiosk to grab any of these. What many Italians do is buy a tray to bring to Sunday lunch. 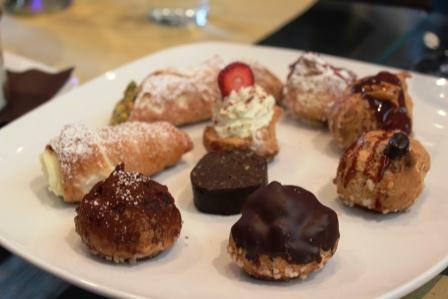 Cream puffs! Caramel and Tiramisu and more. The caramel puff was just the right cross of sticky and crunchy, With caramelized sugar, burnt and sweet, forming a crackle over the top of the cream puff that meets your teeth with a satisfying crunch. Followed by tender cream puff dough and creamy filing. Each bite was more delightful than the next. Two kinds of Tiramisu , both to die for. Since the menu is seasonal, expect to see changes. They were already planning a Summer salad of potatoes, octopus, and cherry tomatoes that will be up soon As well as Ribollita, which I see already on the online menu. Many thanks for a wondeful meal. We'll be back! Those canny Romans knew how to find delicious wine spots. Istria is no exception to the rule. But I thought it might be nice to show you on a map exactly where it is. You can see it circled in Teran purple. Croatia has a ton of coastline and has felt influences from its neighbors as the flags have changed. I felt a distinctly Italian sensibility on my Istrian excursion, along with a boldly Istrian pride and an indelible mark of terroir. There is a special uniqueness to the flavors, a gentility to the people and a beauty in the countryside, sea and green, that is hard to match. The Istrian Tourist board does a great job of providing tools to help you plan your vacation, but at the end of the day, I think they want you to be able to make your adventure your own. There was a book I didn't buy, Wine Wizards of Istria, not knowing it would be impossible to find in the US. I might have carried it home had I known. I remember it had detailed stories and super glam shots of the winemakers. I thought, yes. these guys are wizards. After all what is the best souvenir? Wine! First up is Meneghetti. Romana and Miroslav Pliso renovated the stone guest house or stancija in 2001. It's a beautifully and comfortably done space that says "Welcome!" at every turn. And not just because the staff is there, saying welcome and plying you with wine. It fell into decay at the fall of the Hapsburg empire, but now is fresh and elegant, the warmth of the traditional clay tiled roof with modern charm. Fresh and elegant would describe the wine as well. We had a delish 2003 Meneghetti Cuvee a bright , fresh sparkler made from Pinot Noir and Chardonnay with 10% Pinot Blanc blended in. It had a gossamer hint of color, more warmth than pink. My other favorite was the 2009 Meneghetti Red a rich blend of Merlot, Cabernet Sauvignon and Cabernet Franc. It had a spicy character with red currants and mole sauce. We had a delicious wine soaked lunch in the beautiful space. This luxury villa can be rented and would be a great space for an Istrian adventure with 8 of your closest friends. 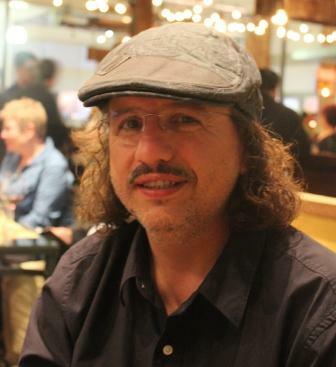 Another of the winemakers chronicled in the book is Ivica Matosevic. His mom was a chemist and his dad studied water, so naturally, his DNA predisposed him to become a winemaker. He began making wine as a hobby, but was super good at it and got hooked on the history, the science and most of all (yay for us!) the flavor. 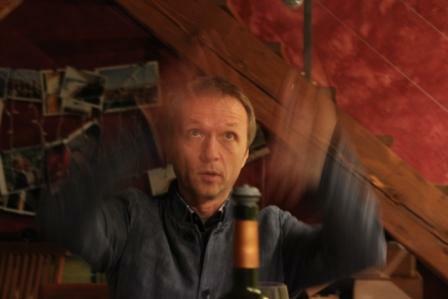 His goal is to express the unique Istrian terroir, so you can taste it in the wine he makes. The investments in modern wine making equipment really pay off. 2010 Alba (Malvasia) We tried an oaked barrel sample. Bruno Trapan seemed more bad boy than Wizard. He puts his signs in Japanese Kanji characters because it amuses him. And has a clock facing the floor, ostensibly so if you are overserved at least you can wake up and know what time it is. Who hasn't needed one of those? Our visit was super fun and the wine was amazing. Bruno named two wines after his daughters the first, Rubi , which is an easy drinking rose of Teran. 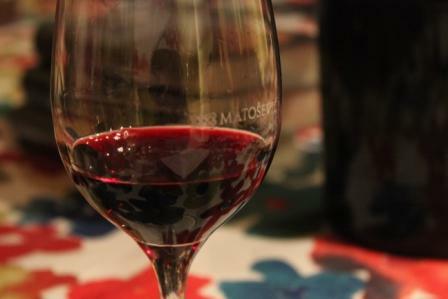 Also a dessert wine of intoxicating roselike flavors and aromas made from muškat ruža after his daughter, Rose called Dark Rose. He believes the vineyard should take care of is itself and is working to be able to let the soil express itself. His Malvasias were amazing. 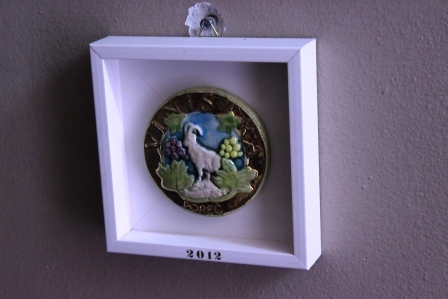 The 2012 Malvasia came form a vineyard with a lot of limestone which gave it nice minerality. You didn;t miss the fruity aromatic because of the complexity. He used 50% malo and my note says it spent a year on the lees to boost the creamy finish. 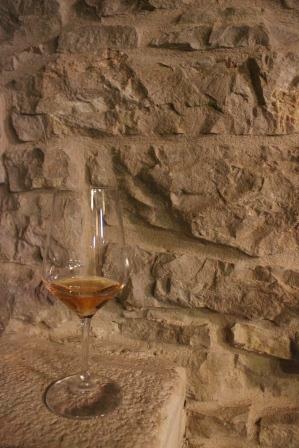 the 2011 Malvasia was aged and fermented in neutral acacia barrels. Golden color with hints of spice in the aromas. According to them, acacia opens up the flavors and in this case it was true with apricot and smoke flavors and a lush round mouthfeel and lingering finish. 14% alcohol but balanced. He opened a sample of a sparkling Teran---an idea whose time has come, which we loved. Bright, fresh and bracingly brut. 2012 Nigra Virgo Revolution (Cab-Merlot-Syrah-Teran) A big bold Bordeaux blend with tons of black fruit and a twinkle in its eye, not unlike Bruno. He explains that the Teran speaks for itself bringing rich, spicy special flavors---and it does. The 2012 Teran was a brawny red. It spoke for itself in a tasty way. 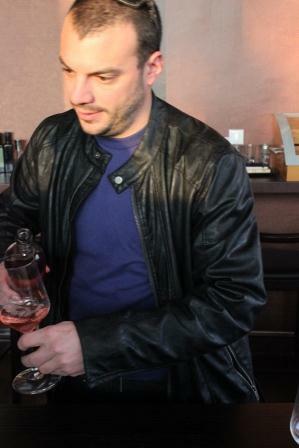 Winemaker Dmitri Brecevic is of French descent. He graduated oeonlogy school in France, then travelled the world making wine in France and also working in Australia and New Zealand, too. Then he settled near where his father was from in the town of Buzet. Where he now makes wine in a converted World War II water bunker. Thank you , Mussolini! He named his venture Piquentum, which was the old Roman name for Buzet. 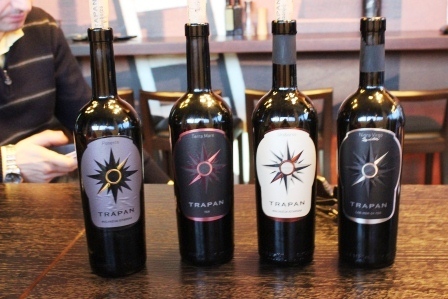 He uses the three indigenous grapes, Malvasia, Teran and Refosc to create wine expressive of Croatia and its red and white soils. And they are tasty. Good news! You can do your own winechair travelling as Blue Danube makes it easy to order these wines. 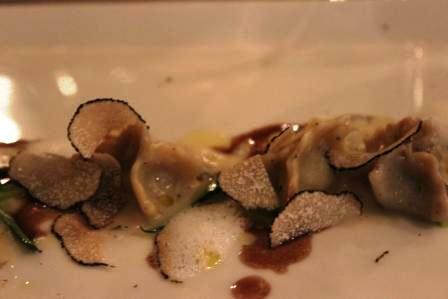 The Trouble with Truffles - my visit to Restaurante Zigante, Livade , Croatia (Istria). There is only one trouble with truffles as far as I can tell: you can never get enough. This was almost true at our truffle lunch at the lovely Restaurante Zigante. Perfectly prepared and generously doused with perfectly shaved truffles at each course, I think I finally had enough--almost. The restaurant is owned by Giancarlo Zigante who found the world's largest truffle, an amazing 1.310 kg in 1999. At the front of the restaurant, there is a replica of that truffle. It is, literally, as big as your head. 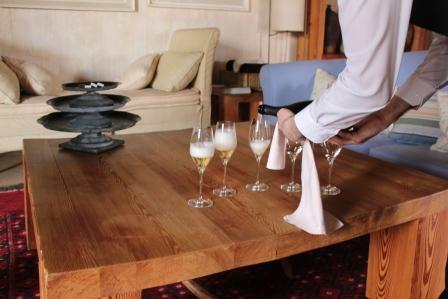 The restaurant is lovely inside with stellar service and delicious cuisine that highlights the delicacy of the truffle, as well as matched and served perfect pairs in the wine. First, truffles are fungi that grow completely underground. Truffle is the everyday name and an easier marketing handle than the clinical terms for the actual tasty treat. Since they are concealed by the ground they grow in, truffle hunters use dogs to locate truffles. Only 20% of the puppies who set out to become truffle dogs actually make the cut. Istrians prefer dogs because they are better companions and less competitive for the truffles than pigs. Pigs know a good snack when they see it. Truffles vary in color from white to black. The best way to serve them is to shave them thinly. Their unique earthy aroma and flavor is best matched with simple fare. The complexity of the truffle flavor will shine. My favorite pair is sparkling wine. I love to start dinner parties with an easy treat. Pop some corn. Douse with mixtute made from half a stick melted butter, 1/4 cup white truffle oil, then sprinkle on black truffle salt. It's easy and quick, but paired with sparkling wine will start your dinner party right. Be prepared for people to beg for the "recipe". It is near the picturesque hill town on Motovun. Worth visiting on its own and conveniently located near the forests that are home to truffle hunters galore. ﻿The tourist board warns that Istria may enchant you. It's true. This heart shaped peninsula a little to the right of the cuff of Italy's boot, protected by the Alps to the North with a long coastline is an adventure you should consider. Biking, diving, etc. But more than anything else: Wine! Not so far from the Hotel San Rocco in Brtonigla, we visited the Cattunar Winery where we got a tasty and informative lesson on the Malvasia grape, as well as tasted through some of the winery's interesting indigenous (Teran) and international varieties (Chardonnay, Merlot and Cabernet Sauvignon). types and bottle them according to color of soil. 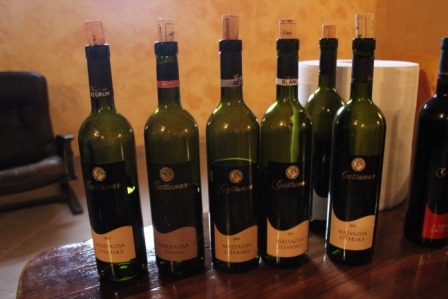 I loved the chance to taste the difference the soil type made given that the producer, variety and year were identical. Holy terroir, Batman! Tasting all four highlighted the difference between the soil types. Blanca: Planted in white limestone soils, this wine had dancing aromas of pineapple. The mouthfeel was soft and smooth. It had pleasant juicy flavors. While the finish was short, it had quince and strawberry. Black: Lots of floral notes of acacia and flavors like acacia honey. Lingering finish. Grise: Round full aromas of peach and white flower. Floral, peachy stone fruit flavors. Medium body mouthfeel. Wine Rorschach! They made us list our top two favorites and each of us had different pairs. All in all a fascinating exercise. Cattunar also gave us a little history lesson. . The region was famous for wine back in Roman days. The Empress Livia boasted that Istrian Teran was her elixir of youth; she lived to be 82, so might have been on to something. 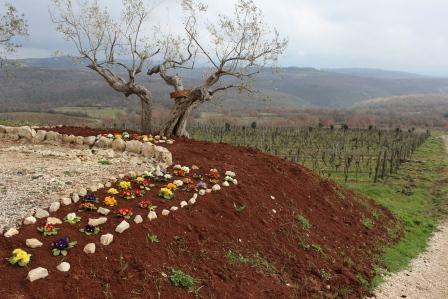 At Cattunar, they informed us that the premium wine industry in Croatia is undergoing a rebirth. Under communism, all wine was produced as bulk wine regardless of quality, so there was little incentive to develop. With the "reboot" that occurred in the 90's, they have been able to take the raw materials at hand, and grow quickly. The folks at Cattunar have a redevelopment phase of their own. 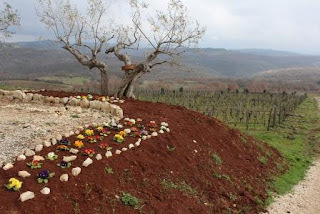 Thirty to forty years ago, the winemakers had only 7 hectares. Now, they are one of the largest producers with 20-30k bottle production. Their next phase includes building a 20 room guest house, where visitors will be able to experience more Istrian gastronomy side by side with the wine. It seems to be working! They have won this local prize two years in a row.